Since 2007 Katrin Amunts is a member of the editorial board of Brain Structure and Function. She is member of the German Ethics Council since 2012, and since 2016 vice chair of the German Ethics Council. Katrin Amunts is the programme speaker for the programme Decoding the Human Brain of the Helmholtz Association, Germany as well as speaker of the Helmholtz Portfolio Theme Supercomputing and Modeling for the Human Brain (SMHB). 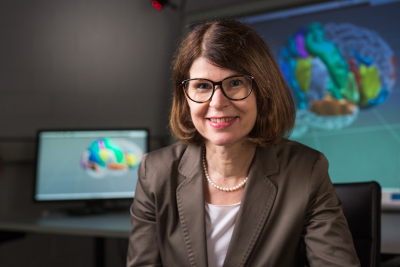 Since 2013 Katrin Amunts is leading the Subproject 2 Human Brain Organization of the European Flagship Project, The Human Brain Project (HBP). 2016, she has been elected as the Chair of the Scientific and Infrastructure Board (SIB) of the HBP. Since 2017 Katrin Amunts is the co-speaker of the graduate school Max-Planck School of Cognition. In order to better understand the organizational principles of the human brain, she and her team aim to develop a multi-level and multi-scale brain atlas, and use methods of high-performance computing to generate ultra-high resolution human brain models. The human brain has a multi-level organisation and high complexity. New approaches are necessary to decode the brain with its 86 billion nerve cells, which form complex networks. To elucidate brain architecture at the level of nerve cells and their axons, and, at the same time, keeping the topography of the whole organ makes it necessary to analyse data sets of several petabytes per brain, which should be actively accessible while minimizing their transport. Thus, ultra-high resolution models pose massive challenges in terms of data processing, visualisation and analysis. The Human Brain Project is developing a multimodal human brain atlas, which integrates the information of brain organisation from multiple levels including cellular architecture, connectivity, molecular and genetic maps, and results from neuroimaging studies of the brain from healthy subjects and patients. Empirical research is supplemented by modelling and simulation, resulting in new data that is stimulating new experiments. The Human Brain Project creates a cutting-edge European infrastructure to enable cloud-based collaboration among researchers coming from different disciplines around the world, to create development platforms with databases, workflow systems, petabyte storage, and supercomputers opening new perspective to decode the human brain.